Who doesn't love a little fun in the sun? The beach can be a perfect way to spend the day and get some summer moments with you loved ones. Summer means sun, shorts, sandals,. bathing suits, and bronzed skin. But with beach hair and shorter hemlines comes the dangers that not only instigate the probability of skin cancer, but the again process as well. Sun exposure is, essentially, subjecting yourself to sun damage - but in the same not, avoiding the outdoors altogether is both impractical and nearly impossible. Dermplus Moisturizing Sunblock is the answer to your skin problems this summer. It is formulated with unbeatable UVA and UVB filters to protect your skin in the harsh ultraviolet radiation from the sun. Dermplus sunblock physically blocks and reflects light and it also helps heal skin damage caused by over-exposure to the sun. Dermplus Sunblock is available in different SPF's like SPF 24 that is recommended for morena skin and for indoor use, SPF 35 for fair skin and SPF 80 and SPF 130 for extreme outdoor activities. Use Dermplus Moisturizing Sunblock and worry no more about the harmful Ultra Violet A (UVA) and Ultra Violet B (UVB) rays. Whether you will go spend your summer in Boracay, Cebu, Palawan or Bohol, never forget your number one sun defense partner. 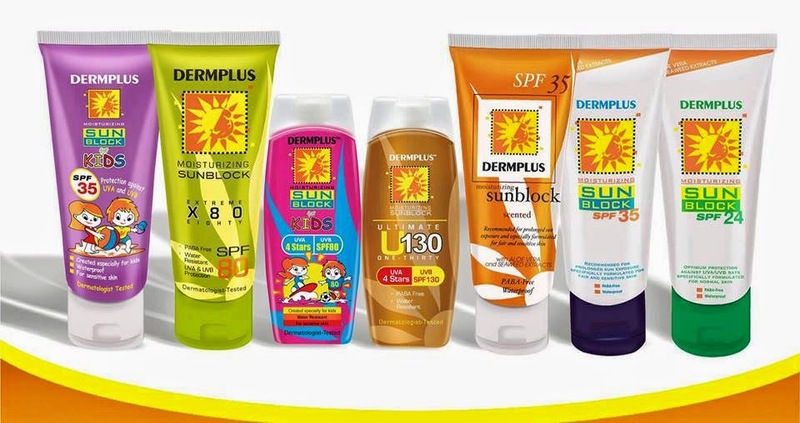 Dermplus Moisturizing Sunblock is available in all leading drugstores, supermarket and departments stores nationwide. For more information, call 817-33-03 or Like Dermplus on Facebook.